Professors’ Open Source Summer Experience (POSSE), a training bootcamp targeted for faculty members of technical universities in Asia is being organized from November 9-13, 2009 at Nanyang Polytechnic in Singapore. Faculty members from Singapore, Malaysia, China, India are expected to participate. The first camp was held in Raleigh, North Carolina earlier this year in July. The goals for the camp are ambitious. A cross-section of topics focusing on development tools and techniques aims to recruit new contributors to open source projects by providing a hands-on experience to participants using Fedora as project examples. The 5-day camp starts with an overview of open source, then dives into communication tools such as IRC, wikis and blogs to teach participants how to be effective contributors. Development topics include compiling source code, using build tools, setting up a build environment and packaging with RPM. Testing and bug fixing are easy routes for users to become contributors. Participants walk-through the process of filing bug reports with Bugzilla as well as editing, testing and creating bug patches. The camp is being organized by Harish Pillay, Jasmine Ee, and Alan Ho from Red Hat Singapore. Mel Chua and Greg DeKoenigsberg are mentors for the program. You can find out more about POSSE Singapore at its website. I think this program is an excellent start in the right direction by Red Hat and its Asia Pacific (APAC) team to facilitate open source education. Engaging faculty from engineering universities is key to increasing contributions as well as growing the talent pool of engineers in emerging markets to support industry demand. This entry was posted in Asia, Code, Collaboration, Community, Education, FOSS, OpenSource, RedHat and tagged Asia, Code, Collaboration, Community, Education, FOSS, OpenSource, RedHat on October 2, 2009 by Alolita Sharma. Dom Sagolla has been a key mover of the iPhoneDevCamp movement since day one. It’s been impressive to have Dom’s energy, enthusiasm and ideas take the iPhoneDevCamp to next level. Throughout the DevCamp, Dom was hard at work, helping folks as well as making progress on his upcoming book. Here are Dom’s responses to some questions I had for him at the camp this year. The iPhoneDevCamp model offers a winning formula for community collaboration events. It is likely that other technology communities may be able to use this model. What would be your advice to them? It’s already begun with things like AndroidDevCamp, PreDevCamp, and now “WinMoDevCamp“. My advice is always this: Make the event all about the participants. When you focus on building teams, polishing ideas, and creating truly compelling demonstrations, you are following the model of BarCamp. A 10 year old developer won applause as the youngest participant at the DevCamp this year. How do you see the camp inspiring kids in school and in general? 10-year-old Annika has my favorite story this year. Having been dragged along to last year’s event, she made the best of it by reviewing the apps of other participants. This year, she’s created @KidGameReviews and started developing her own games! Annika shows us just how easy it is to get started with iPhone Development. She’s still learning but the growth I’ve witnessed over the past year, in her and in the community, is inspiring. iPhone is a lens, through which the problems of computer science may be examined. I hope kids of all ages get a chance to play with Apple’s superb example code just to see what’s possible in a few days’ time. Every year we sponsor a few student participants at iPhoneDevCamp, and we will certainly continue that tradition. Perhaps we’ll add to this a new category of “Youngest iPhone Developer”. Some apps such as Avatar Wall, winner in Coolest iPhone App category, used Twitter to demonstrate their ideas. What do you think is the impact of social networking services such as Twitter on the type of apps being developed? Twitter is becoming a communication utility, like other service providers online and in our homes. Seeing the Twitter API in use at iPhoneDevCamp is another sign that social networking is now a fixture in our lives. iPhone was launched just when Twitter began to gain prominence two years ago. There has been a complimentary arc of growth for both Apple and Twitter since then, and Twitter was profiled as an “Apple Business“. I see the intersection of iPhone and Twitter as a kind of cultural nexus. The best of breed Twitter apps are on the iPhone / Mac platform, and the most virulent iPhone apps integrate well with Twitter and other social media. The two platforms combined create a vortex of attention and zeal that is driving innovation on both ends. How does a community event like the iPhoneDevCamp that has grown in popularity every year fit into the iPhone developers ecosystem? How does it complement official (e.g. by Apple) and unofficial (e.g. barcamps) activities? I like to think of iPhoneDevCamp as a “sister event” to WWDC. Folks go to learn new technologies and talk with Apple engineers at WWDC. Inevitably they are inspired and want to test their knowledge, so we have created iPhoneDevCamp where they can form teams and build things. The relationship is complimentary: We do our best to schedule around Apple’s events, and stay in contact with them at an informal level. In the BarCamp tradition, we want to be a model for other Open Source communities to band together, find sponsorship, and field events of their own. I think the Satellites program launched for last year’s iPhoneDevCamp, with double the participation this year, pretty clearly shows our commitment to the BarCamp way. Your writing project “140 Characters: A Style Guide for the Short Form” sounds exciting. Is there going to be a chapter about using Twitter at the iPhoneDevCamp? You mentioned you’d be gathering some source material for the book at the DevCamp. Did you notice anything interesting about how Twitter was being used by the participants (and organizers)? Tell us more. I do talk about iPhoneDevCamp in “140 Characters”, yes! Our use of #ipdc3 as a tag this year, as well as a few choice quotes from our performer @BT are profiled: http://bit.ly/140-chars. iPhoneDevCamp itself formed out of the Twitter community. @Ravenme wrote to @ChrisMessina who posted an inquiry for space, which I picked up because I’d just started following Chris in mid-2007. I replied in public to Chris, he followed me back and the rest is a history of 100% year-on-year growth. We did an experiment this year, where we made our Satellite broadcast available via iPhone and iPod touch for the first time. Tweeting that link resulted in about 1000 viewers around the world. That’s how I measure reach: How many people are tuned into your message RIGHT NOW? I measure impact with action: in the last days of Registration for the camp, we sold out three (3) times. Each time capacity was lifted, we tweeted the Registration link and we were sold out again within hours. The Twitter community is voracious for learning and real-life connection. Tapping into that has been critical to the success of iPhoneDevCamp and the iPhone Developer community abroad. What can we expect at DevCamp 4? Any surprises coming up? Next year: iPhone Jam Band! Seriously we haven’t talked about plans for next Summer yet. Right now is the time to follow up with all the Satellite communities and see how we can enable more events elsewhere during the year. We would be thrilled to work with Yahoo! and all of our sponsors again next year, which we know will be yet again bigger. Dom Sagolla helped create Twitter with Jack Dorsey in 2006 then co-founded iPhoneDevCamp with Raven Zachary in 2007 (just a week after the launch of the original iPhone). After helping Raven and the team create the Obama ’08 iPhone App in 2008, Dom started his own company DollarApp in San Francisco, resulting in two Staff Favorites: Big Words and Math Cards. @Dom’s book “140 Characters: A Style Guide for the Short Form” is the subject of his next iPhone invention, shipping this Fall. This entry was posted in Apple, Barcamp, Code, Collaboration, Community, Contribution, Entrepreneurship, Innovation, iPhone, OpenSource, Unconference and tagged Apple, Barcamp, Code, Collaboration, Community, Contribution, Entrepreneurship, Innovation, iPhone, OpenSource, Unconference on August 16, 2009 by Alolita Sharma. 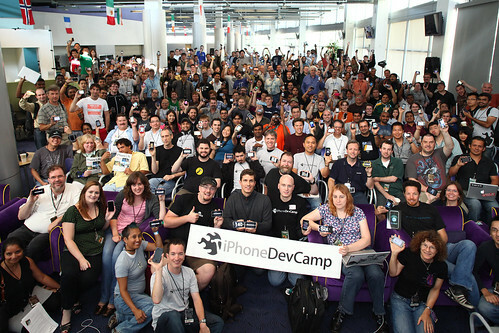 iPhoneDevCamp 3 ends with a roar: 54 apps showcased! What a weekend at iPhoneDevCamp 3! Community and friends coming together to collaborate, hack code, enjoy great food and soak in the picture perfect weather at Yahoo’s beautiful campus – what else could an open source geek ask for? Here is the group photo of everyone who participated this year. I thoroughly enjoyed the Dev Camp this year- there were some excellent talks on Saturday. There was plenty of time for hacking and the results of the hackathon were paraded out on Sunday afternoon. Open source and web applications hacked together over the weekend were showcased. Other apps included alpha versions of future App Store products. More than 60 apps were entered for the hackathon and 54 of these were were showcased in the demo session. Chris Allen, guru and mentor for the hackathon along with other judges watched each demo with great attention and afterwards announced the winners in each app category. The winners are listed here. My congratulations again to Raven Zachary, Christopher Allen and Dom Sagolla – the key movers for making this Dev Camp happen. And thanks to Yahoo! for providing a fantastic venue for everyone to gather and build some innovative web and native iPhone apps. Looking forward to iPhoneDevCamp 4! This entry was posted in Apple, Barcamp, Code, Collaboration, Community, Innovation, iPhone, Unconference and tagged Apple, Barcamp, Code, Collaboration, Community, Innovation, iPhone, Unconference on August 3, 2009 by Alolita Sharma. The third iPhoneDevCamp kicked off Friday evening at Yahoo!’s scenic campus with an enthusiastic audience and an excellent talk by Chi Hua-Chien’s session on iFund, Kleiner Perkins’ venture fund for iPhone applications. Today started with a great presentation by Andrew Stone on ‘How the NeXT Computer Became the iPhone’. There are at least 400 people now, forming groups to develop their apps. Some are listening to BT, the current speaker who is a musician and DJ who is presenting his iPhone app Sonifi that allows users to remix music. Sonifi also has in-built stutter gestures using the iPhone accelerometer. You can stretch these stutters to extend sections of music which makes it sound metallic. Interesting stuff! After this session, a pizza lunch and four parallel sessions of talks on web and native development tools and techniques are coming up. Time to get back to work on our app for the hackathon! This entry was posted in Apple, Barcamp, Code, Collaboration, Community, Innovation, iPhone, Unconference and tagged Apple, Barcamp, Code, Collaboration, Community, iPhone, Unconference on August 1, 2009 by Alolita Sharma. Bram Cohen, creator of BitTorrent has been organizing a peer-to-peer applications unconference named “CodeCon” in San Francisco since 2002. Pulled together by Bram Cohen and Len Sassaman, the unconference demonstrates bleeding edge software apps and allows programmers to show off their coding prowess. After a hiatus for a couple of years, Bram has now restarted the conference. Applications that’ll be showcased include effortless BitTorrent deployment with BitTorrent DNA, a distributed transaction layer for Google App Engine, a trend profiler for C/C++, and a parallel web browser for handhelds and multicore laptops. In addition, a BioHack track will demonstrate cool biotechnology apps. For programmers in the Valley who are interested in the latest peer-to-peer applications, CodeCon definitely is a place to be. CodeCon will be held from April 17-19, 2009 at CellSpace on 2050 Bryant Street in San Francisco. The program can be found here. This entry was posted in Biotech, Code, Community, Innovation, OpenSource, Unconference and tagged Biotech, Code, Community, Innovation, OpenSource, Unconference on April 7, 2009 by Alolita Sharma.